Do you love sushi, but you've gone low-carb or grain-free? This Paleo Sushi is a great way to still enjoy sushi without all the carbs, and bonus–since it's in Temaki form, it's a super easy meal to boot! Food from other countries are a great way to experience new tastes as well as learn more about other cultures. This Paleo Sushi is not only great for those reasons, but it's a super easy meal as well. Some other great foods from other cultures on this blog are Pakistani Kima (ground beef curry), Moroccan Carrots, Moroccan Vinaigrette and Chat Masala, my version an Indian spice that goes great with almost anything. Oh, and don't forget Egg Roll in a Bowl too! 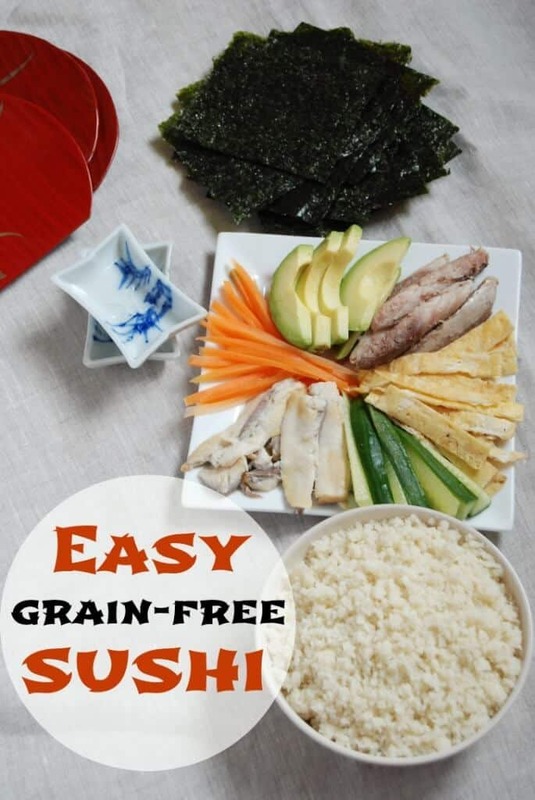 Sushi is a favorite dish for many people, but if you are eating grain-free, it doesn't fit in with that kind of diet. With this Grain-free Sushi, however, you can have sushi again. It not only fits a grain-free lifestyle, but it also is a fun way to serve sushi that doesn't involve all of the rolling and fuss, so you can have sushi any time of year, even when you're short on time. 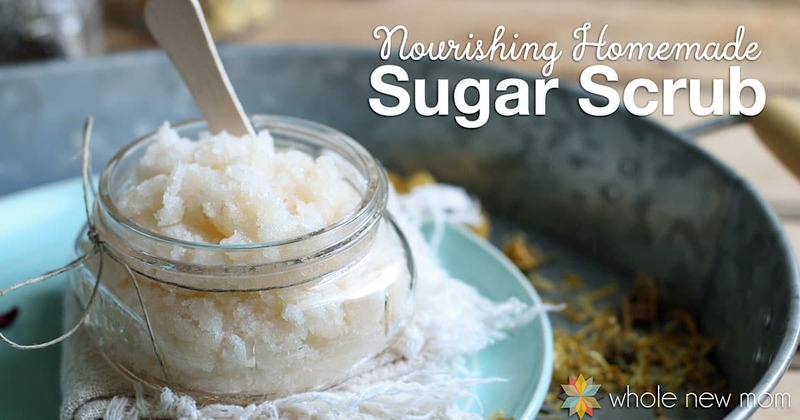 It's interesting how our childhood foods can become our comfort foods. For me, how my parents ate and cooked heavily influences how I eat and cook. My mom comes from a solid meat and potatoes pioneer-like farm; my father is from Japan. When my parents were newly married, my mother was feeling nauseous as she was pregnant with me. My thoughtful father cooked for her what his mother cooked for him when he didn't feel well: miso soup. One whiff of boiling fish stock and poor Mom bolted outside. Mom soon learned to cook Japanese food as well. As kids, we were as likely to get a bowl of miso soup as a bowl of homemade yogurt when we weren't feeling well. When I was pregnant, I craved Japanese food. Unfortunately, I didn't often get it as such foods were just starting to come to Slovakia then. With a real food mom and Japanese dad, all us kids enjoyed beef tongue, thought Egg Roll in a Bowl were normal, and wouldn't have blinked an eye at Sweet Beef Heart Curry. One meal all us four kids enjoyed was sushi. With four hungry teens to feed, however, my parents didn't have time to roll beautiful little sliced bites of sushi, as sushi is usually pictured. Instead, they served a style of sushi called temaki, hand rolls. In our house, that meant a buffet style of sushi. 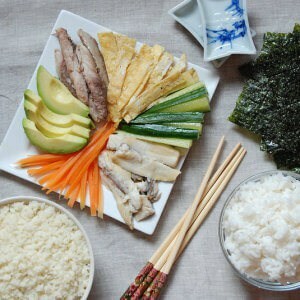 Mom or Dad would prepare the rice, slice up the fillings, and cut some nori. We would then all sit around the table and choose what we wanted, making our own temaki. Now that I have my own table of hungry kids, temaki is an easy and fast way to feed the hoards, while still getting a sushi fix. For the fillings, pretty much anything goes. Japanese descendants in Brazil make sushi with fruit, like mangoes, strawberries, and kiwi. I've included a list of ones I like, with instructions for preparation. Choose whichever ones you like and feel free to add your own. For those not eating grains, cauliflower makes a pretty good substitute. I've seen some recipes that saute the cauliflower rice in oil but I prefer to steam or boil it, as rice for sushi is never cooked with oil. This paleo sushi is great for a family meal, or large gathering. It's fun for kids (and adults) to eat with their hands and makes the sushi preparation super simple for the cook, which is always nice. Bonus-it works for the Whole30 diet as well! Is Sushi Without Fish Rice Really Sushi? Traditionally sushi is thought of as a dish made of raw fish and rice. However, the definition of sushi is this: “a Japanese dish consisting of small balls or rolls of vinegar-flavored cold cooked rice served with a garnish of raw fish, vegetables, or egg.” So there are of course people who will argue that sushi without fish or rice just isn't sushi after all. 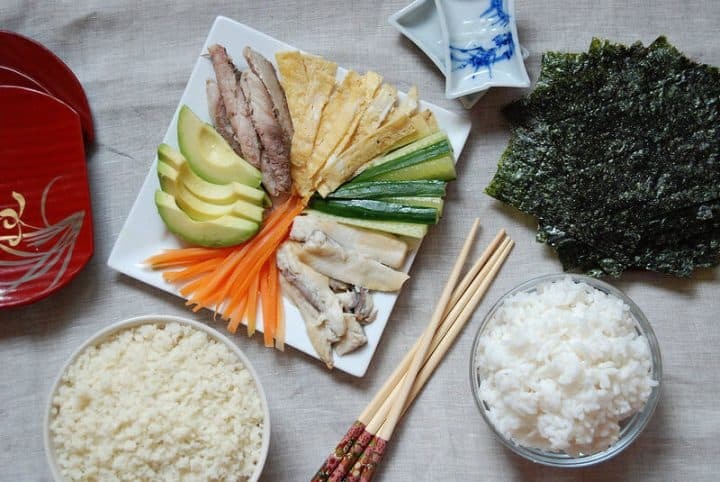 Adrienne can tell you from her time living in Japan and spending loads of time immersing herself in the Japanese culture, that sushi is often served just as a roll of gelatinous rice and nori with egg or veggies, fish or roe (eggs). Sashimi is the name for raw fish. Interestingly enough, the low-carb trend is hitting Japan too as you can see in this article from the Japan Times, where a restaurant in Osaka (one of the largest cities in Japan) has started serving sushi made with riced radish (daikon, a very large white radish) as the rice alternative. So if you think that sushi without fish or rice isn't sushi–think again! Pickled herring and pickled sardines are great options for pickled fish. Salmon, mackerel, trout, etc. will work for smoked fish. You can use different amounts of the ingredients for the wrap and seasonings. Those are just the amounts we use. Use organic coconut aminos instead of tamari for AIP. Temaki - An Easy Grain-free Sushi Recipe you can make for a crowd. Made with cauliflower rice, it's a lower carb version of a Japanese delicacy. fold one sheet in quarters (half, then half again). Unfold and lay over a stack of seven or so sheets, cut along the fold lines with scissors to make nori squares. In a blender or food processor, mix cauliflower with water until it resembles rice. Pour both cauliflower and water into a pot and bring to a simmer. 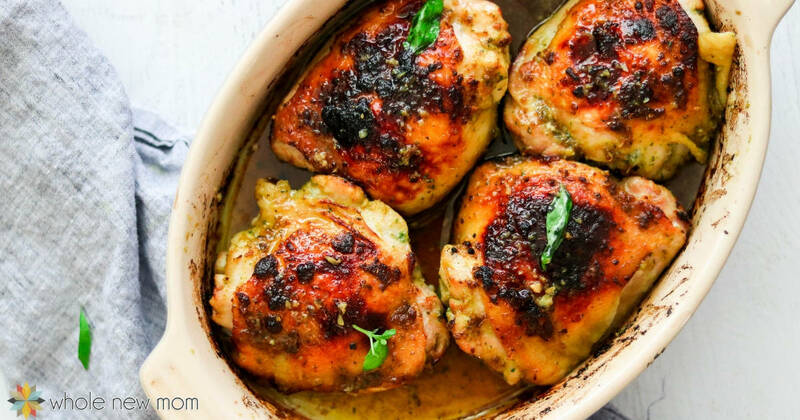 Simmer until soft, about 15 min. Mix together vinegar, maple syrup, and salt. 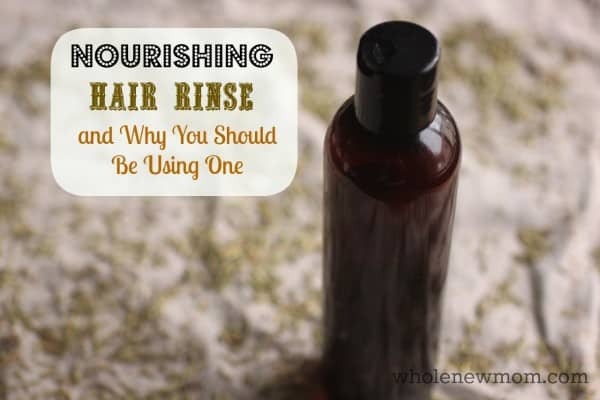 If using other types of vinegar or sweetener, what you are aiming for is a mixture that is slightly acidic, slightly sweet, and slightly salty. Different areas of Japan prefer different proportions of each. Stir until salt dissolves, then pour into the cauliflower rice and mix well. With real rice you would fan it as you lightly tossed the rice so that it shines, but I don't think cauliflower will do that. Put the cauliflower rice into a serving bowl. Slice cucumber in half lengthwise, then from the centre out, making long triangles (see picture). The reason for this is so that each cucumber piece has green skin, important for aesthetics. Julienne carrot (cut thinly into long strips) and steam until just softened. It shouldn't be crispy, but not mushy either. Whisk two or three eggs with a pinch of salt. Technically tamago (Japanese style egg for sushi) should have a little sweetener and dashi (a fish stock), but I rarely do that. The easy way is to make an omelette and cut it into strips. The proper way is to make a thin crepe in a minimally oiled small frying pan, when it's cooked on one side but still soft on the upside, roll it to one side and, leaving it there, pour more egg to make another crepe. When cooked on one side but still a bit liquidy on the top, roll the original rolled egg crepe to the other side, repeat for all the egg. For all the other ingredients, cut into two to three inch strips. Place chosen fillings on a plate. 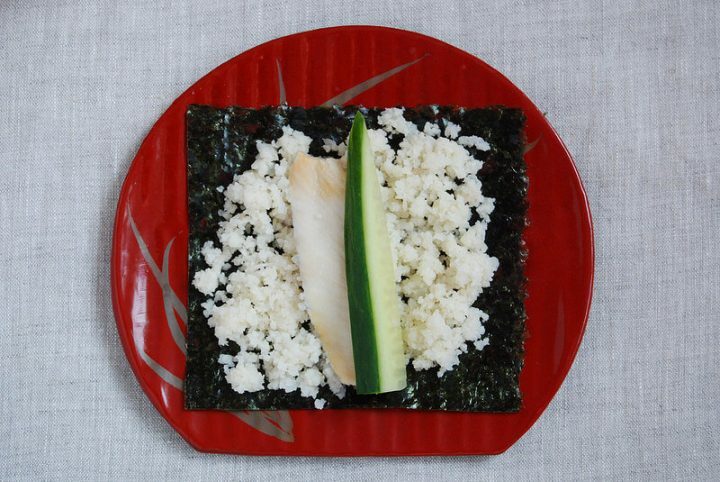 To assemble, lay a square of nori on a plate or in your hand. Put some cauliflower rice on the plate, lay your chosen ingredients across, close it up, and dip it in tamari/coconut aminos. If desired, you can mix a little wasabi on the side of the dish with the coconut aminos/tamari. To cleanse the palate between sushi rolls, you can have a piece of pickled ginger. Homemade Sushi is a great way to introduce your children to food from other cultures, and when it's grain-free sushi, it's great for getting more veggies into kids' diets. Have you ever had temaki? Naomi is originally from Canada but is now a wife and mom in Slovakia. She tries to live each day as a follower of Christ in the chaos of caring for children. Using real food and creating an environmentally-friendly surrounding for her family is a priority. She dreams of a little farm while living in an apartment, enjoys handmade creations, and still doesn’t like brussels sprouts. Naomi shares her food creations and photos of Slovakia at Almost Bananas. She looks forward to connecting with you on Pinterest and Facebook. Sushi IS grains because sushi is rice. Most people in the us think it is fish or rolls. It is not. Grain-free sushi is a big misnomer. Grain-free sushi-style rolls is more accurate: it’s a distinction with a significant difference in meaning. Sushi does refer to sourness, assumingly of rice, but if it is named ‘grain-free’ then obviously there must be some change to the original. I am of the belief that food evolves (sometimes for better or worse), especially as various cultures and diet regimes adopt them. Technically, the original sushi was fermented fish and rice, and they didn’t even eat the rice. Then they ate the rice fermented after a few days, then not fermented at all but soured with vinegar. Ketchup wasn’t originally tomato based, we make hummus from black beans and avocado. Grain-free sushi-style rolls is more accurate, but also rather more cumbersome. I don’t think anybody will be deceived by the lack of distinction. I hope you enjoy it!!! Thanks for the support as well. Hope to see you around again. This sound ridic awesome. I love sushi but often feel pretty guilty for eating mostly RICE so this is a new twist on sushi!